There's nothing like a school of Yellowfin ambushing your bait spread and having every rod on the boat bent over with line screaming. Or how bout a monster Wahoo skyrocketing an outrigger bait. Or better yet, the beautiful yellow, green and blue colors of the Mahi-Mahi as it jumps to free itself from the end of your line. 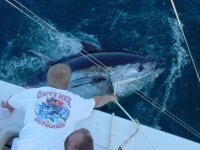 Its Gulf Stream fishing from Ocean Isle and its peak mid March thru mid June. The Gulf Stream is located some 55 miles offshore and thus requires a 13 hour trip. Approximately 2 hours travel time each way can be expected with 8 hours of fishing time. Fishing is typically done aboard the Carolina Cat- 33 foot World Cat- fast, comfortable and great fishability. Yellowfin Tuna, Wahoo, Mahi, Sailfish and Marlin are in your future should you choose to join us for a Spring Gulf Stream fishing adventure. It's awesome Stand-up fishing action for the best fighting and best eating fish in the ocean. The best light tackle fishing experience of your life is at hand. Don't miss the line sizzling runs and awesome strikes. You'll fish live bait on 20# class stand up outfits. 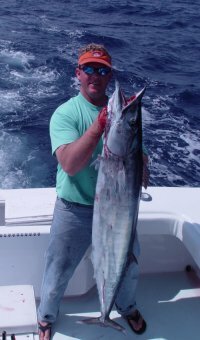 The Fall king mackerel average 20 pounds with many that will be larger. The kings are aggressive, often jumping from the water as they strike the bait. The make long runs and are a ton of fun to fight. Typical catches in October and November are of double digit kings in the 20-30 pound class. AND THEN if that wasn't enough, you can switch over and do some grouper fishing without having to go too far. In the Fall, grouper in the 10-20 pound range move into the same depths as the king mackerel are often found and make for a great combination fishery. Grouper are strong and of course, incredibly good to eat. 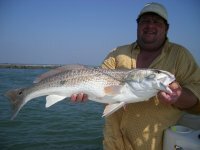 The Fall and Spring are peak times to fish inshore for Flounder, Speckled Trout and Redfish. During this time the water temperatures are preferable for these fish and thus they are active and aggressively feeding. You will likley fish both natural and artificial baits. A great inshore fishing experience.